For the past few years, as the number of influencer marketing platforms appeared to propagate unchecked, we’ve seen the emergence of a debate around the best way to find new influencers. Do you go with an “influencer agnostic” tool that scrapes the social web for data on millions of users and then indexes that data for an easy search? Or do you choose to go with an opt-in platform, which lets you search through a much smaller database of influencers who’ve signed up to be there? Though people on either side of the debate had no problem talking down the other, the truth is there are pros and cons to both ways making them equally valuable at serving different needs. At the current moment, however, the Opt-In might have the edge. This is all due to Instagram’s surprise announcement in April that it was restricting access to user data sooner than expected. Suddenly, the scrapers of the world have a problem. Their model relies on the ability to grab public data in bulk through Instagram’s API, and now Instagram is telling them some of the data is off-limits, while slowing down access to whatever’s still available. Vendors who develop services like this can’t exactly send out a mass email to the billions of social media users in the world, asking them to share their data. Well, they could, but they wouldn’t meet with much success. On the other hand, companies like Tagger Media—an opt-in marketplace with over 1 million influencers in their database—don’t have this issue. When an influencer chooses to join a platform, it’s easy enough to get her to authorise access to her profile and post data. Without that—the ability to analyse her audience and performance—a brand wouldn’t really get much out of working with her. For that reason alone, the value of companies like Tagger and its competitors went up the day Instagram started deprecating key pieces of its API. Not that Tagger Media needed the help. Founded in 2015 by Peter Kennedy, Tagger began life as a music recommendation engine, tracking social conversations and analysing fan preferences as the foundation of a “If you like X, then you’ll like Y” service. Once it became clear how much their algorithms and analytics could glean from these conversations, the pivot to influencer marketing became an inevitability. 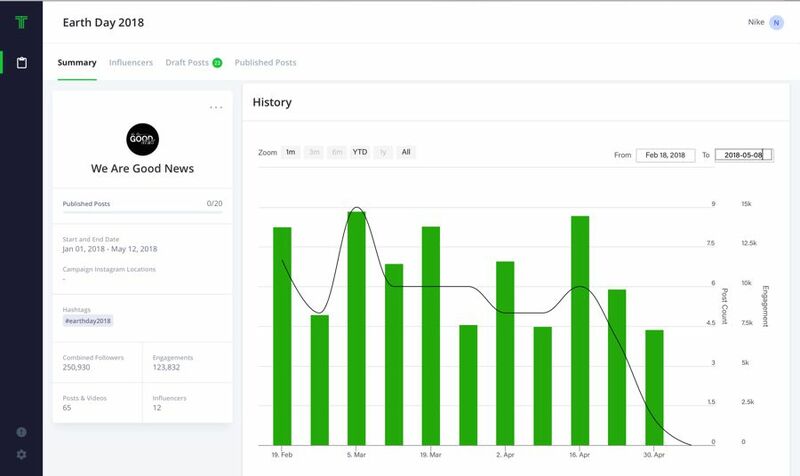 Fast forward to this year, when Tagger is now tracking something like 8 billion social conversations resulting in over 28 billion data points—all indexed, analysed, and searchable, by brands and agencies alike. It’s one of many features of Tagger’s platform which elevate the idea of a marketplace into a full-fledged influencer marketing solution. Like most influencer platforms, this one is Software as a Service, so you’ll be paying a subscription fee for access. This is not software for a small business. Unlike your average influencer marketplace, Tagger’s service is incredibly robust. It offers more use and data than a small company would know what to do with. Their roster of clients includes big companies like Verizon, Chase Bank, Dove, and Sephora, and Prada. They’ve also got some big influencer agencies, too, including Vayner Media and Pulse Advertising. For detailed pricing, you’ll need to contact Tagger directly. In a lot of ways, it feels reductive to refer to Tagger’s platform as a “marketplace.” It has all the features of one: you can perform advanced searches on a database of influencers, finding ones who you might like to work with; you can create campaigns that open only to those that you invite, or make them open so anyone can apply; you can manage all the influencers and their content submissions easily; you can analyse the performance of all posts and influencers and determine your ROI, if any. So, yes, it sounds like a marketplace—but there’s so much more to it. Like all standout platforms, the basis of what makes Tagger Media so useful is its data and insights—in this case it’s the platform’s focus on psychographics that sets it apart. The tech that powers Tagger isn’t just indexing relevant data making it searchable; it’s actually built on a social listening feature that analyses what people are talking about to understand their interests and affinities. Through this, brands and agencies can get a very precise look into what kinds of content will drive engagement with these audiences. It also gives them the same precision in identifying an audience predisposed to engage with an already-planned content strategy. The Affinity Engine, as they’re calling it, can also dissect audience interests and find where they overlap. 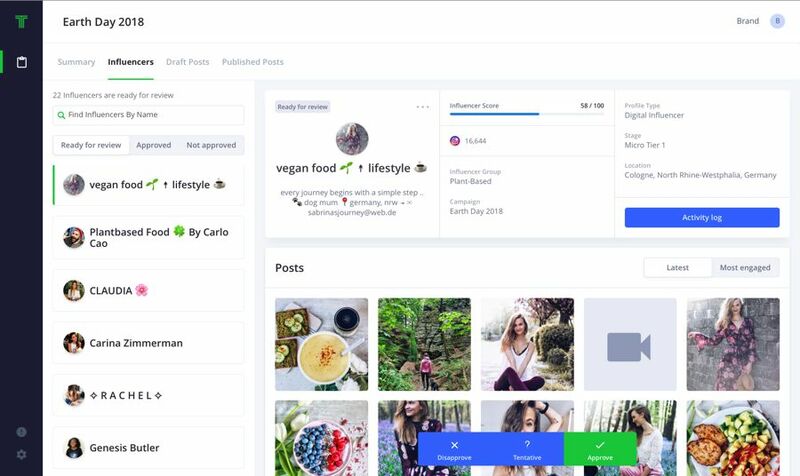 Searches for influencers offer over 50 filters to refine results, so it’s pretty easy to find, say, a food photographer in London with an audience of mostly males in their late 20’s that love pizza and Toyota’s hybrid cars. That’s weirdly specific, but it underscores the power of Tagger’s data and search tools. 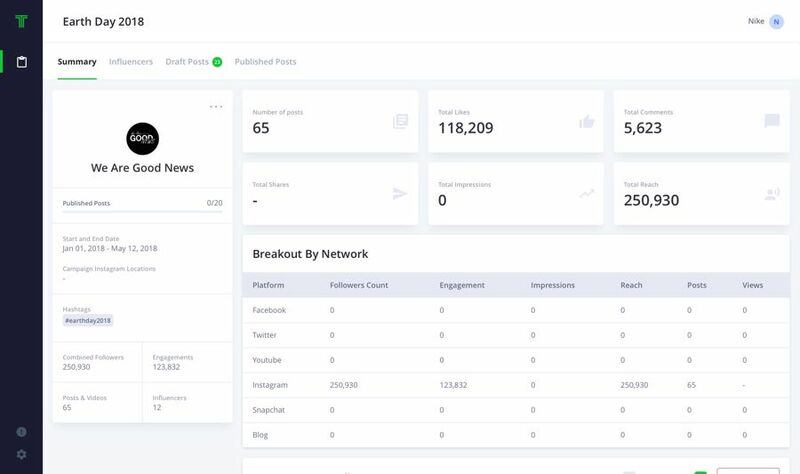 The platform’s data analysis engines give it the ability to “understand” an influencer’s followers enough that it can go and find “lookalike” audiences, pointing you to other potential influencers. These analytics don’t just serve to identify pitch-perfect influencers to collaborate with during campaigns. The listening tool also works as a way for brands to monitor their own social accounts—and their competitors—as a way of ensuring that they’re engaging on all fronts, and doing so effectively. The depth and breadth of the data offered on the platform is still impressive enough to say that Tagger has very few real competitors offering something similar. But they do have a few—and the numbers are only going to increase as time goes on, what with the importance of analytics to an influencer marketing campaign. For this reason, it’s good to see how Tagger differentiates themselves in another regard: by offering an incredibly robust collaborative management system. 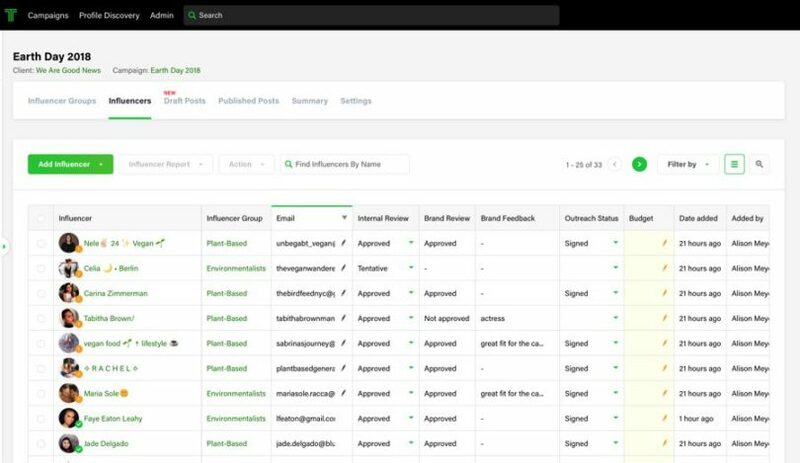 The management dashboard is chock full of ways to organise all your marketing efforts—influencer can be organised into groups, even within the same campaign. 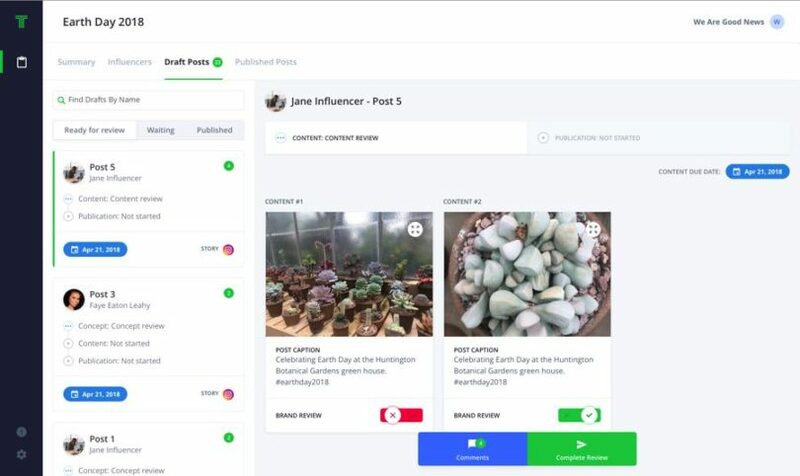 This is very helpful for when there are multiple kinds of content being produced, or you’re publishing across several platforms, or you want to categorise the influencers by reach—really, you can organise them any which way you like and quickly call up the entire group to track their status in the campaign. You can also track the progress of content as each piece is submitted, and all along the way—from influencer activation through publication—Tagger’s customisable workflow tools ensure that everyone who needs to be involved is. Whether an agency’s waiting for brand approval on an influencer or their content, or the influencer needs to submit draft revisions, or teams need to discuss things internally, the platform’s handling of users, teams, and roles, keeps information flowing freely to the people who need to see it. The goal here was for teams to operate efficiently and transparently, and they’ve certainly achieved it. Of course, with a platform that’s this meticulously thought out, it shouldn’t be surprising to know that it includes a solid reporting function, too. Just like with search, you can dive deep into your campaign posts to see how it all went. Engagement, conversions, ROI, CPE, audience data—it’s all here. 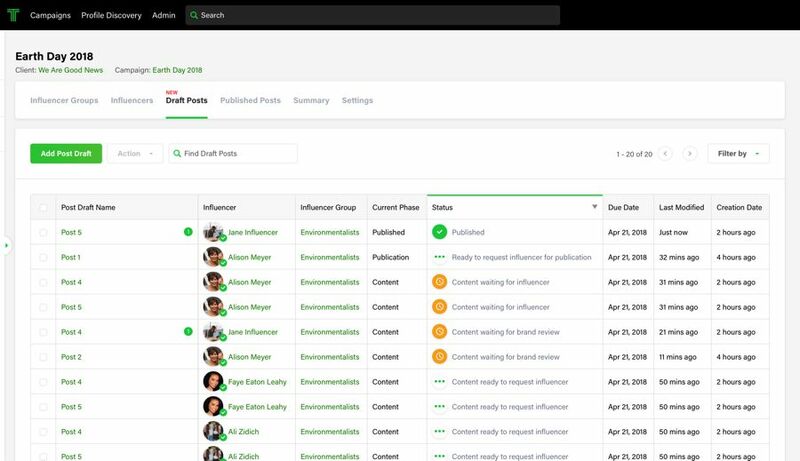 This all sits alongside individual performance stats for each influencer, giving marketing teams all they need to identify their successes and repeat them, then find their failures and avoid them. Maybe you’d get a big pool of influencers to choose from, but finding them was hard. Or you could find them easily enough, but there just wasn’t enough data to make a fully informed decision. Or maybe you’d be able to see tons of data, but there wasn’t a great way to manage the influencers. Or maybe there was a good management interface, but it was overkill because the platform didn’t have that many influencers to begin with. Tagger Media puts all of these concerns in the rearview. And it does that on a platform hosting over 28 billion data points connected to over one million influencers (and their followers). Data is at the heart of it all, data that fuels results. The results then unearth more data, and the new data fuels more results. Maybe “marketplace” isn’t the right word. Maybe “ecosystem” would be better.